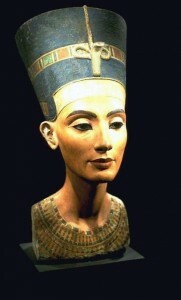 How Akhenaton started the Age of Aquarius at the Wrong Moment « CONSTABLE RESEARCH B.V.
Akhenaton (1300 BC), married to the beautiful Nefertiti, reformed the state religion of Egypt in a very rigorous way. In that time the main deity was named Amen. Out of the blue Amenhotep adopted an old deity called Aten and changed everything. He not only changed his name (his old name was Amenhotep IV) but he also erased Amen from all the inscriptions of the capital Thebes and built a new capital to the north of Thebes called Akhetaten, the place where Aten rises. The powerful priests of Amen (or Ammon) did not like this move and revolted. The priests of Aten were expelled of Egypt and fled to Palestine. The leader of this expedition was the high priests of Ahktnaton called Ra-Mose. The mother of Ahkhnaton was Tiye. She was the daughter of the Chief Minister of his Father, Yuga. 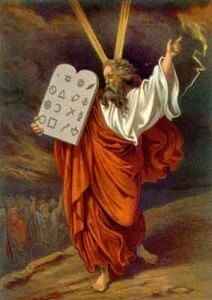 In 1939 Sigmund Freud published a book called “Moses and Monotheism“. In this book Freud argues that Moses was the High Priest of Akhenaten. Yuga, the father of his wife is the Jewish patriarch Joseph and his high priest Ra-Mose is the Moses of the Old Testament. In Moses and Monotheism, Freud claims that Ra-Moses only led his close followers into freedom and that they subsequently killed Moses in a rebellion. Freud explains that years after the murder of Moses, the rebels formed a religion which promoted Moses as the Saviour of the Israelites. This religion was a mixture of the worship of Aten and Zoroaster (Mithras). Maitreya is the Hindu-variant of Mithras. The Roman Emperor Constantine created the New Testament of the Bible. He used the widespread Cult of Mithras to introduce Christianity in the Roman Empire. The cults of Mithras and Maitreya expect a return of an enlightened teacher on Earth. His coming is characterized by a number of physical events (lowering of the sea level, strange weather conditions, decline of nature, war and other disasters). At this moment we are living in the Kali Yuga literally the “age of darkness“. 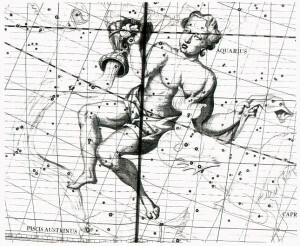 A complete cycle takes a precession of the equinox, 25. 200 years. All the epochs together equal 12,000 years in the ascending phase and 12,000 years in the descending phase. The lengths of the periods maintain a 4,3,2,1 ratio to each other. This means that the end of the Cycle (the Dark side, Amen, Kali Yuga) is situated in Pisces and the new cycle starts with the Age of Aquarius. Stephen Mehler wrote From Light into Darkness (2005) and The land of Osiris. He has researched the ancient wisdom (Al Khemit) of the original civilization of Egypt. According to Mehler the original culture of Egypt believed in a cycle that consists of five stages. The first stage was called Aten (The Light) and the last stage that started around 3000 BC was called Amen. This is the stage of the Darkness. In the first stage humans are highly conscious and are capable of many capabilities like travelling in time and space with their Light-Body. This stage is related to the old continent of MU (the Land of Dreams). 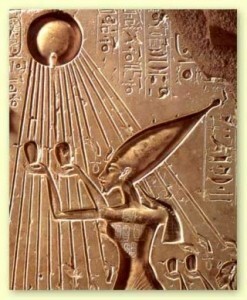 The Light of Aten was the Light of Enlightment, the Spirit of Creation. During the stage of Amen Religion was created and the priests became an important power. The priests invented the Gods and used rituals and rules to manage the masses. The Roman Emperors did the same with Christianity. It was transformed from an inspirational movement of the followers of the Light (the Gnostics) to a very intelligent way to continue the Roman State. At this moment Spirit and Soul are on their return. They show the coming of the Age of Aquirius. For until now unknown reasons (perhaps the influence of his mother who came from “India”) Ahkhnaton started the new cycle of Aten when the cycle was not completed. He revolted at the wrong time. He wanted to bring the Light in the time of Darkness and was stopped by the Institution of the Church of Ammon (Materialism). After his death the priests almost wiped out his existence. It took a lot of research to reconstruct his life. By accident (does it exist?) he send the 12 tribes of Israel to their Homeland and by his High Priest Moses started the Jewish Religion that generated the Christian Religion that was also stopped by the new Priests of Ammon (The Roman Empire). At this moment many people in many religions are waiting for the new Maitreya to come who will restore the stage of the Light. Ahkhnaton was a King-Poet. Some scientist believe he is the biblical King Solomon. Ahkhnaton/Solomon created The Great Hymn to Aten. How manifold it is, what thou hast made! And what is on high, flying with its wings. Everyone has his food, and his time of life is reckoned. As thou distinguishest the foreign peoples. This entry was posted on Tuesday, April 1st, 2008 at 9:29 pm	and is filed under Completed, History. You can follow any responses to this entry through the RSS 2.0 feed. You can leave a response, or trackback from your own site.